We are located in Health Science Center Level 3 (east campus main office) and Old Computer Science Building Level 2 (west campus annex). By car: Take the Long Island Expressway (Route 495) to Exit 62; the Stony Brook ramp exits onto Nicolls Road North (Route 97). Follow Nicolls Road for nine miles entering the SBUH medical campus on the right at the north entry to the University Medical Center, park in the visitor parking lot, enter medical center through the front entry, which is level 5; at reception area bear left past the gift shop, then bear right down corridor to HSC elevators; take HSC elevators two levels down, room 043. By Air: Exit left from Islip-MacArthur Airport onto NY-454 E/ Veterans Memorial Hwy. Stony Brook exit is approximately 3 miles on the right. Merge onto Nicolls Road north (Route 97) towards Stony Brook. Follow Nicolls Road for twelve miles; entering the SBUH medical campus on the right at the north entry to the University Medical Center, park in the visitor parking lot, enter the Medical Center through the front entry, which is level 5; at reception area bear left past the gift shop, then bear right down corridor to HSC elevators; take HSC elevators two levels down, room 043. For ticket info go to http://www.islipairport.com. Our west campus annex is located at CS 2213 and 2214 (2313 Computer Science, Stony Brook, NY 11794). The Computer Science Building is located on Lake Drive. 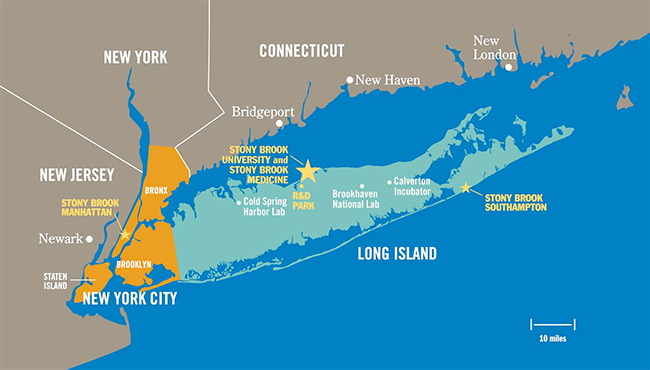 Detailed travel information can be found on the Directions to Stony Brook page on the Stony Brook website.